Roger Ludlow was born in England in 1590. He was educated at Oxford, and then went on to complete his studies in law. He was truly a puritan and an intellectual leader of the period. He also became an active member of the Massachusetts Bay Company. The lure of the new land in America was a challenging and adventurous attraction to Ludlow. He came from England to the New World in 1630 on a ship that he owned. Similar land purchasing agreements in this vicinity included the trade of blankets, hoes, knives, axes, kettles and mirrors. The original detailed trading documents for Fairfield were destroyed and burned by the British during the American Revolution in 1779. In the Harbor is a typical ship of the period and to the rear of Ludlow is a mountain laurel, now the Connecticut State Flower. 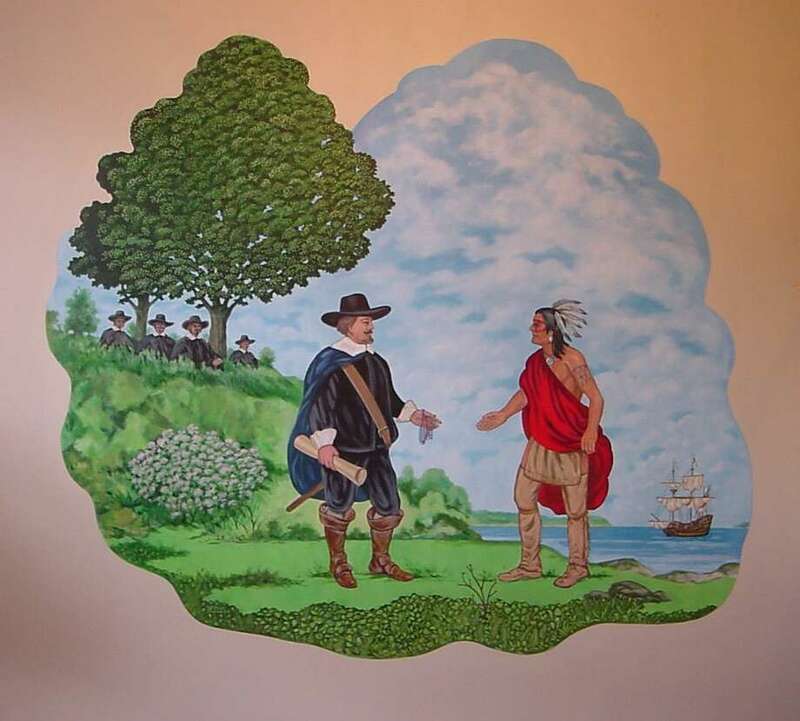 The information here is reprinted from the Fairfield town website and the image of the mural is courtesy of Jim Gilleran. For more information about Fairfield history, visit the Fairfield Museum, located at 370 Beach Road. Learn more about the history and culture of Fairfield, view rotating exhibitions and purchase Fairfield-themed gifts at the Museum Shop. For more information visit Fairfieldhistory.org or call (203) 259-1598; Fairfieldhistory.org.